These ape pants are made of a polyester base material with acrylic fur making it light weight and comfortable to wear. Elastic waist fits up to 48" and hook and loop closures allow for adjustment of length. Includes pants with foam inserts to give pants a fuller look. 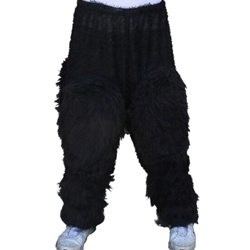 These black hairy pants are perfect for creating the look of a gorilla, ape, flying monkey, or any number of other animals and mythological beasts. Can be used by directors in a number of different shows including The Wizard of Oz and The Lion, The Witch, and the Wardrobe.